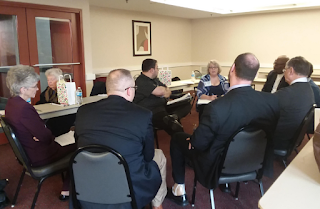 Representatives from several United Methodist boards and agencies met with representatives from the United Methodist Association of Ministers with Disabilities (UMAMD) and the DisAbility Ministries Committee (DMC) on April 2. 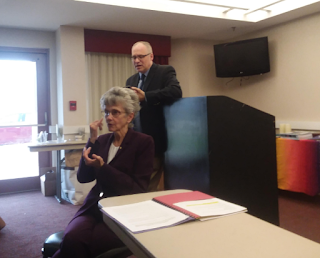 Thomas Kemper (GBGM) suggested and funded this meeting and Bishop Peggy Johnson and Rev Leo Yates prepared the logistics. 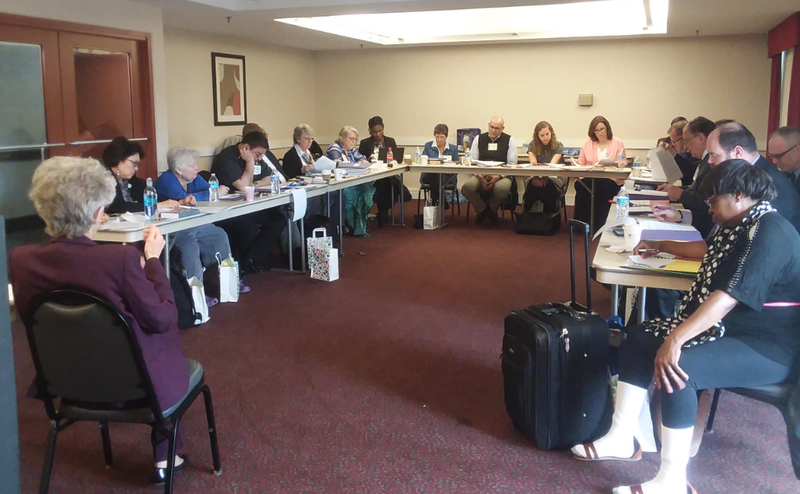 The meeting was held in Baltimore, Maryland. 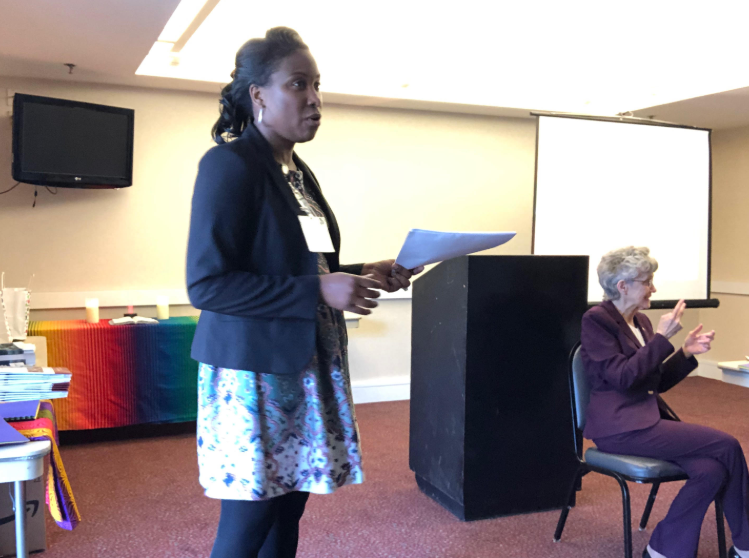 It included representatives from the General Board of Global Ministries (GBGM), General Board of Higher Education and Ministry (GBHEM), General Board of Church and Society (GBCS), United Methodist Women (UMW), United Methodist Men (UMM), General Commission on Religion and Race (GCORR), and Discipleship Ministries. The meeting opened with worship led by Bishop Johnson. Soon after, representatives networked and shared brief reports of how their board or agency engages with persons with disabilities. Bishop Johnson has sought to find an agency for the DMC after it had stopped receiving financial support from GBGM. Following their reports was a disability awareness briefing that was led by Rev. Debby Hills, a deacon from the Western Pennsylvania Annual Conference and a member of the DMC. Currently, Bishop Johnson is assigned to the DMC, which is temporarily overseen by the Council of Bishops. It was noted that 20-25% of persons in the world have some sort of disability and many are underserved, and often oppressed; moreover, this population is vital in all the work we do across boards and agencies. The Rev. 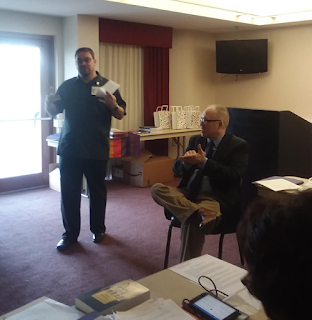 Giovanni Arroyo of GCORR shared with the group that Erin Hawkins, the General Secretary of GCORR, had been having conversations with Bishop Johnson about bringing the DMC into GCORR. It was pointed out how both the DMC and GCORR have a strong emphasis of advocacy in their work. All persons present were delighted to hear the news. While there was an initial conversation immediately following the group meeting, a transitional meeting is planned for this fall. Included in the agenda was a discussion of proposed disability-related legislation and resolutions for General Conference 2020, which was facilitated by Rev. Jackson Day, a representative of GBCS and an advocate for persons with disabilities. Those present provided input and feedback to better perfect the proposals. The final legislation discussed would place the DMC back into The Book of Discipline. It had been (unintentionally) removed from the 2016 General Conference, which led to it losing financial support from GBGM. It was pointed out by Sabrina Rodgers, of GBGM, that the agencies present had shown to be engaged in various forms of ministries and programs with persons and communities with disabilities. Rev. Jonathan Campbell, the co-chairperson of UMAMD (a caucus) added that including it helps to ensure another level of accountability from discrimination, in which he shared briefly his own personal experience of ableism when he went through the ordination process. The representatives from UMAMD and DMC shared their appreciation for everyone’s input. The session concluded with the sharing of a “hopes list” that was facilitated by Rev. Leo Yates, Jr., a consultant with the Committee on Deaf and Hard of Hearing Ministries (GBGM). The disability groups identified ways the boards and agencies can be more accessible and engaged with them and persons with disabilities. For example, Yates requested their websites be better accessible so they can be reader-friendly for persons with vision loss and by the use of captions (on videos) for those who are Deaf and hard of hearing. Rev. Nancy Webb, a UMAMD representative, expressed the hope that each of boards and agencies’ public events be more accessible, as well as using venues that were accessible. Campbell encouraged the boards and agencies to utilize the disability group’s expertise and knowledge when funding large programs or projects to ensure their vitality. Rev. Russell Ewell, a deacon and the outgoing co-chairperson of UMAMD, encouraged each board and agency to have a person with a disability or an advocate for persons with disabilities on their board of directors (or committees) to bring the much needed voice and perspective. When discussing funding support, the Rev. 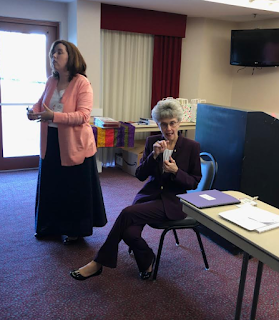 Sung-Ok Lee, representing the UMW, announced to the group that she will propose to the UMW to provide $500 a month to help support the DMC with staffing. Bishop Johnson thanked everyone for attending the meeting and encouraged everyone to continue to stay engaged in this important work.